I recently returned from a week’s holiday in Avignon in Provence, Southern France, a town and a region with a great and enduring love for good food. Returning to the contrasting food culture of the UK has left me pondering about the very strange paradox that seems to underpin the British public’s relationship with food. On the one hand, UK restaurants have undergone a renaissance over the past two decades, with most of our major cities now boasting at least one Michelin-starred restaurant. We also have a wealth of extremely popular TV cookery programmes: MasterChef, Great British Bake Off, the Hairy Bikers, Saturday Kitchen, The Taste, to name but a few. Recipe books written by celebrity chefs regularly feature in the list of UK best selling books. Yet, on the other hand, the UK consumes more take aways, ready meals, crisps and savoury snacks than the whole of the rest of Europe put together. It would seem that those TV cookery shows, recipe books and fine dining restaurants are a diversion from – rather than a reflection of – our true relationship with food. How do these starkly different facets of our behaviour towards food marry up? One explanation, I believe, lies in the fact that many of us falsely believe we simply don’t have the time to cook a proper meal. Another is that most of us have locked ourselves into the routine of a weekly supermarket shop. Because what we buy has to last a week, a smaller proportion consists of fresh basic ingredients, and more of it consists of processed and prepared foods that have a longer shelf life. Over a sustained period of time supermarkets have gained more and more control over our shopping habits and over the food that reaches our plate. In the process they have forced out of business many quality food suppliers, independent greengrocers, local bakers and the like, and of course they have brought us the abomination known as the “ready meal”, a cultural low point as far as creativity and the use of fresh ingredients in the domestic kitchen goes. Compared to the rest of Europe, the UK also has a significantly higher proportion of its population who are clinically obese, and should you want to source healthy organic food then increasingly you have to make quite an effort to find it. Indeed, walk through the centre of any UK town or city centre and you will find the retail food sector dominated by an unhealthy cluster of fast food outlets – McDonalds, Domino’s, Gregg’s, Subway, Pizza Hut, Burger King, KFC and the like. Depending on the time of day, you are also likely to see an unhealthy number of overweight young people, many of them with body shapes that you would normally associate with much older people. 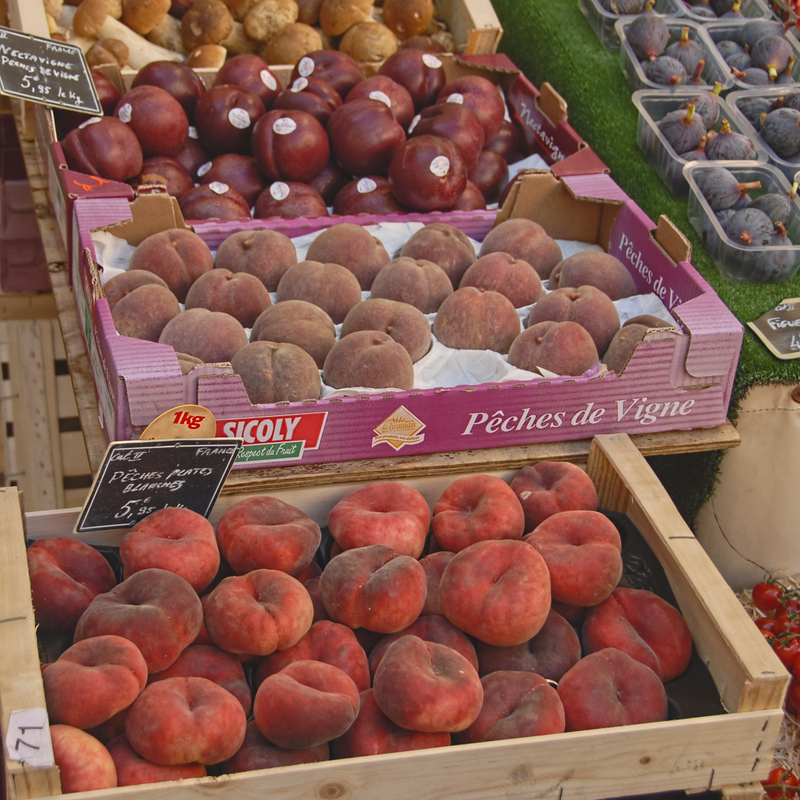 By contrast, the centre of Avignon is dominated by a large indoor food market, open five days a week and selling a wide range of fresh, good quality, locally produced food. It is an area which is bustling with local people purchasing fresh fruit, vegetables, fish, meat, eggs, cheese and bread, often on a daily basis. Around Avignon, towns such as St Remy de Provence, Orange and L’ Isle-sur-la-Sorgue also hold regular and thriving food markets. 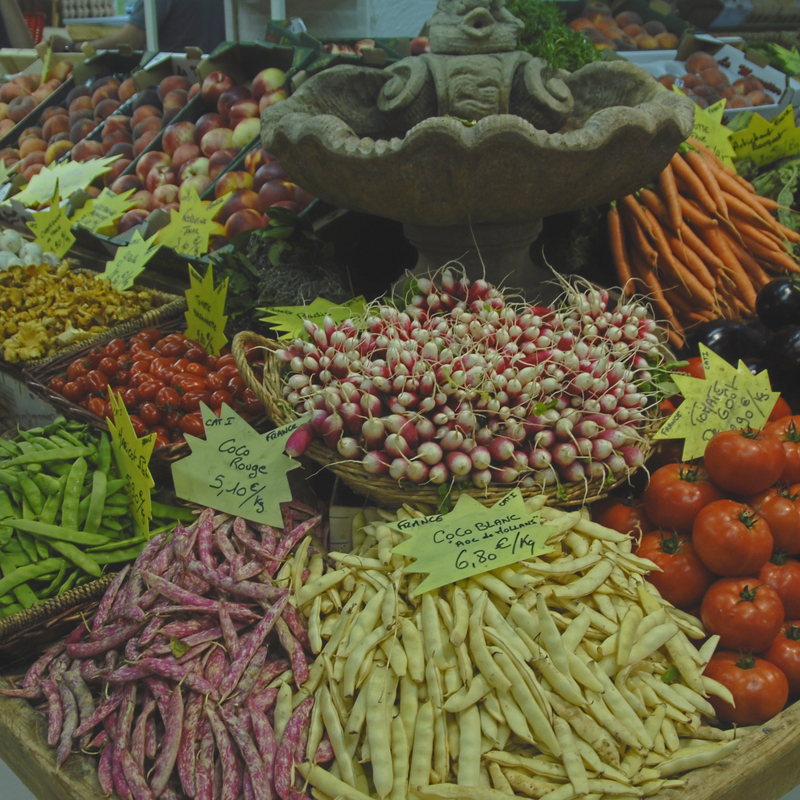 The markets of Provence exemplified for me an altogether healthier relationship with what we eat, one where good, fresh food is a deeply embedded, essential, ritualistic part of the rhythm of life. However, despite my pessimistic overview, I don’t believe we are complete culinary write-offs as a nation. Throughout the UK there are pockets of resistance: we do have some truly wonderful food markets, such as Borough market in London, there are organic farmers and growers, artisan bakers, cheese makers, slow food advocates, farm shops, farmers markets, Fairtraders, food cooperatives and the like. A particularly positive development is that over the past few years there has been an increase in the amount of UK farmland devoted to growing organic crops. We have to look quite hard sometimes to find them, but if we are to build or salvage any sort of lasting food culture from our current national fascination with food then we need to make the effort to support these producers by buying their produce and then devoting a little time and effort into creating good, home-cooked food with it. I have to admit that mentally I haven’t completely left Provence yet. 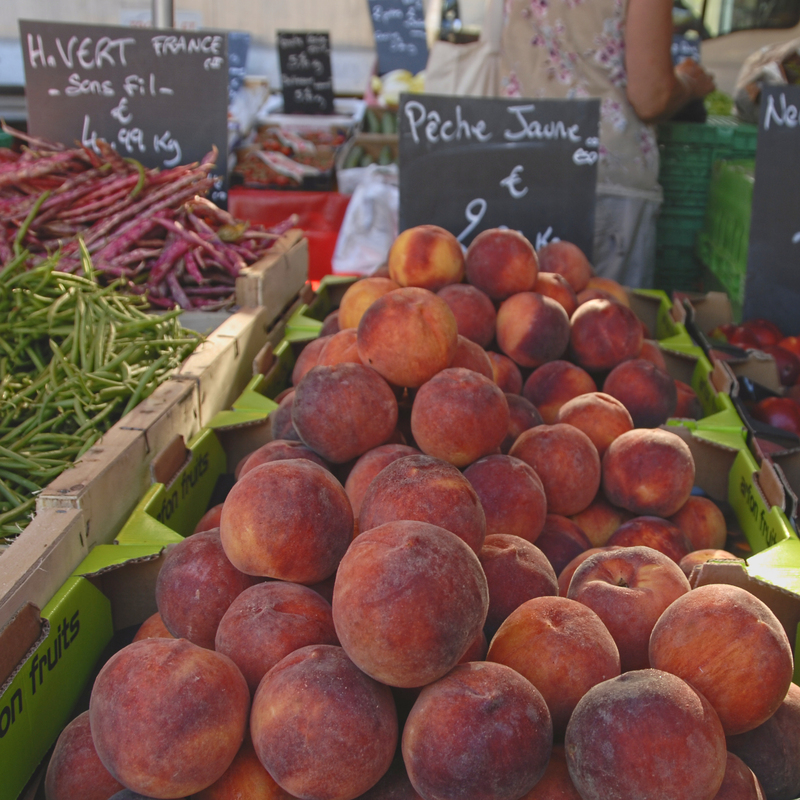 As my wife Sara and I strolled through the beautifully chaotic, sunny markets in and around Avignon (pausing for the occasional coffee), sun ripened peaches seemed to be on sale virtually everywhere, and so it had to be that the peach is at the centre of this recipe. I used a gadget called a smoking gun to smoke the avocados for this unusual but flavour packed salad. It gives them a delightful new dimension. If you don’t have a smoking gun simply use plain avocado, as the base flavours will still work nicely together. Smoked sea salt is fairly widely available. Of course, if you happen to own a smoking gun you can make your own. 1. Halve and de-stone the peaches. Cut each peach half lengthways into three. 2. For the dressing, add the xanthan gum (if using) to the olive oil and whisk to combine. This will make the oil more viscous. Add the lime juice and whisk again. Set to one side. 3. Break up each mozzarella roughly into quarters by hand. 4. De-stone, quarter and skin the avocado pears. Cut each quarter into two, cross ways. If you are smoking the avocado, place it in a bowl and cover with clingfilm. Use applewood chips in the smoking gun and pump smoke under the cling film over the avocados for a couple of minutes. Switch off and remove the smoking gun, reseal the cling film and leave the avocados to absorb the smoke for 5 minutes. 5. To assemble, arrange 3 peach slices on each plate with 4 slices of smoked avocado and 2 pieces of mozzarella. Drizzle the lime dressing around the outside, then sprinkle the chilli, mint and pistachio on top of the dressing. Finally, finish off each plate with a pinch of smoked sea salt. Interesting reading. Love the photos of those gorgeous growers markets. I have seen smoking guns on Aussie Masterchef and have been pondering the purchase of one. Have you used yours a lot? The salad looks fab. You can close your eyes and pretend you are still on holiday…. We all have our vices, and mine is kitchen gadgets. I just can’t help but accumulate them. I probably don’t use my smoking gun often enough to justify its purchase, but it is brilliant with some foods, particularly avocado, but also aubergine, tomatoes, soups and sauces. Thanks so much for your comments. The link to the smoking gun is broken but I found it anyway. I had no idea there was such a device as a smoking gun. Fascinating. Whatever next? The recipe looks amazing! I couldn’t agree more and wish there were more vibrant, bustling markets locally. Those peaches look delicious. It seems so difficult to find a ripe peach in this country; most supermarket offerings seem to have the taste and texture of cotton wool. Having said that, I did buy a beautifully delicious peach from my local greengrocer the other day! I agree about the quality of peaches generally found on sale. I have a particular gripe about the unscrupulous marketing of the “ripen at home” peaches often seen on sale at supermarkets. Fruit is always best picked when it is ripe. The only reason these bullet-hard peaches are on the supermarket shelves in the first place is not for our benefit but because they are much easier to transport over thousands of miles than fresh, juicy ripe peaches. I so agree!!! I love the way continentals think of food and shopping. However, I have an aversion to pop star cooks in the media (although there are some exceptions) as it feels the personalities are more important than the food. I wonder who your exceptions are? There are some great cooks out there who never seem to appear on TV, presumably as they are regarded as not telegenic enough. Paul Gayler is one example: although not a vegetarian himself he has come up with some wonderfully creative vegetarian recipes over the years and his dishes definitely deserve a wider audience. Hi Steve, I guess I would have to say that Nigel Slater is the exception – both appearing on TV and a good cook. However, I must say that I enjoy reading his food column and his cookbooks more than the TV series. His food is right up my alley – simple, seasonal and much of it home grown. I guess I am drawn to cookery writers – another one being Diana Henry – rather than TV chefs. The writing has to come first rather than cookbooks created as TV spinoffs. I’d agree with both of those. I really admire Diana Henry in particular. She puts so much into her writing, her books are far beyond a mere collection of recipes, a true pleasure to read.